One of the unique charms of Wahkon is its easy access to the 126-mile Soo Line Trail. It’s a year-round favorite of ATV riders, bicyclists, snowmobilers and cross country skiers. The importance of the historic rail line can be seen around every bend. Imagine seeing the places where freight was once unloaded for Mille Lacs area pioneers, since 1908, at small cities such as Wahkon and its neighbors, Isle to the north and Onamia to the south. Modern-day explorers may jump off the trail as it intersects S. Main St., near Hwy. 27, Wahkon, to find a great place to take a rest at the Ellen Ruth Park. Your landmark is a fine old launch, painted red and white, which disembarked from the rail line in 1932 to ply the waters of the big lake until the late 1970s. Seeing this restored relic of days-gone-by is just the beginning of a fun day in the city which anchors Mille Lacs Lake’s southern shore. To get started, Wahkon is easily traversed by biker or hiker on roads and trails, while the city streets are ATV friendly. Next to the park, wheeler riders or snowmobilers can fuel-up and get a cup of coffee, soda, convenience snacks and picnic items. Not far away are Wahkon’s friendly eating and drinking establishments well known for their generous meals and convivial atmosphere, favored by the locals, summer residents and tourists alike. City shopping includes a range of interesting stops including gift stores and a quilt shop. Just off North Main St., travelers looking for a little relaxation may choose the two tidy waterfront venues, City Park and Veterans’ Park. From these perches, folks may enjoy an almost endless view of Wahkon Bay and its islands. City Park features picnic shelters, spacious mowed lawn and a biffy. For the day-tripping angler a fishing pier and rustic boat launch ramp provide ample access to the water. Veterans’ Park boasts a walk of honor for military and community honorees which was recently added by a cadre of volunteers. Bring the kids for a good time on the playground equipment, as well. Recent landscaping efforts have improved the park and made it very family-friendly. Nearby resorts offer a wealth of fishing or boating fun for those who decide to stay for a day on the lake. Lodging is also available locally for travelers or long-term visitors. 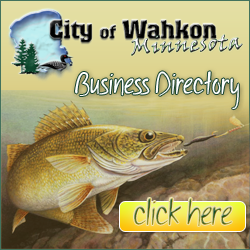 If you decide Wahkon is a starting off place on the Soo Line Trail, you’re never too far from Minnesota State Forests and lake recreational areas and from other more adventuresome byways and approved ATV trails. Just north of Isle, four-wheeler enthusiasts welcome the challenges of the Red Top ATV Trail, for example. Once they’ve visited Wahkon, Soo Line Trail riders are often eager to return to this little gem on the lake. For more information, see the DNR’s website, or www.findthetrails.com with materials on the trail as well as links to a PDF map.